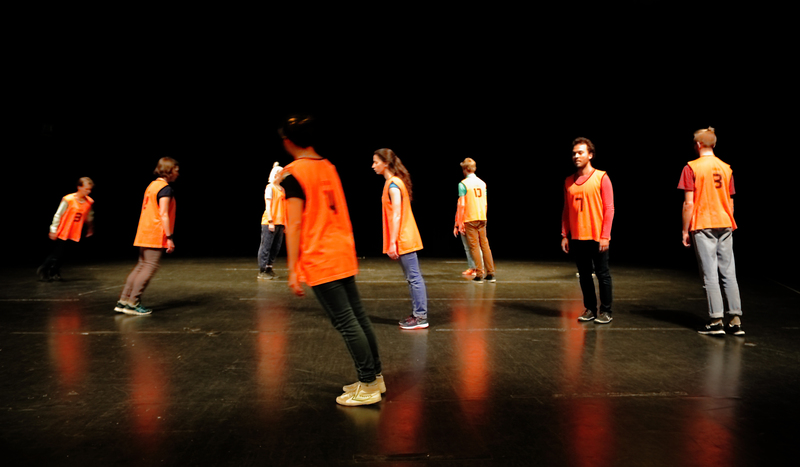 Group Study is a choreographic score for ten performers by Matthias Sperling, conceived in collaboration with neuroscientist Guido Orgs. It was developed as part of a scientific research project investigating the aesthetic and social effects of synchronous movement of groups. Performances of the score are both artistic events and scientific experiments, in which physiological responses are measured via wristwatch-like sensors worn by the performers and audience members. Audience members are also asked to report their experience while watching, using a custom made app on a tablet computer. Before and after the performance/experiment, audience members are asked to complete short questionnaires. The score consists of a series of decision-making tasks or game-like structures, through which the performers engage in a live negotiation of their relationships with one another in time and space. In this choreography, therefore, synchrony and asynchrony are emergent properties of the live interaction of the performers. In contrast with conventional ideas of synchrony in dance, this approach relies neither on the repetition of pre-planned movement sequences, nor external signals (such as music) to establish group co-ordination. This project presented Sperling with the opportunity to directly experience the process of carrying out scientific research activity as an artist-collaborator, developing his long-standing interest in the relevance of neuroscience to dance, as well as his several years of dialogue with neuroscientist and dancer Guido Orgs. Sperling's particular interest in this project is exploring an approach to choreography as a knowledge-generating activity, seeing this attempt at 'scientific choreography' as one possible manifestation thereof. Funded by an ESRC Transformative research grant on "Synchronous movement, cooperation and the Performing Arts"